So I know this is not quite the appropriate post for all those who might have weight loss goals for the new year but think of it as an opportunity to develop more self control. The next time you have an office party, baby shower, bunco party or girls night, you have to try these cookies. They are a-ma-zing! Seriously. Best. Cookies. Ever. Snickers are by far my favorite candy bar. Chocolate, caramel, nougat and peanuts are the perfect combo. Add a cookie on top and I'm in heaven. I got the recipe from a patient of mine a couple of years ago. She was from Hawaii - she made cookie bags for our staff and after getting a pleasant Snickers surprise when biting into the cookie I had to get the recipe. I most recently made these for some cookie plates I gave to the neighbors over Christmas and made Andrew take the rest of them to work so I wouldn't eat them all. Combine butter, peanut butter and sugars using a mixer on medium to low speed until light and fluffy. Slowly add eggs and vanilla until throughly combined. Then mix in flour, salt and baking soda. Cover and chill dough for 2 to 3 hours. Unwrap all Snickers. Remove dough from refrigerator. Shape about 1 tablespoon of dough around each candy. 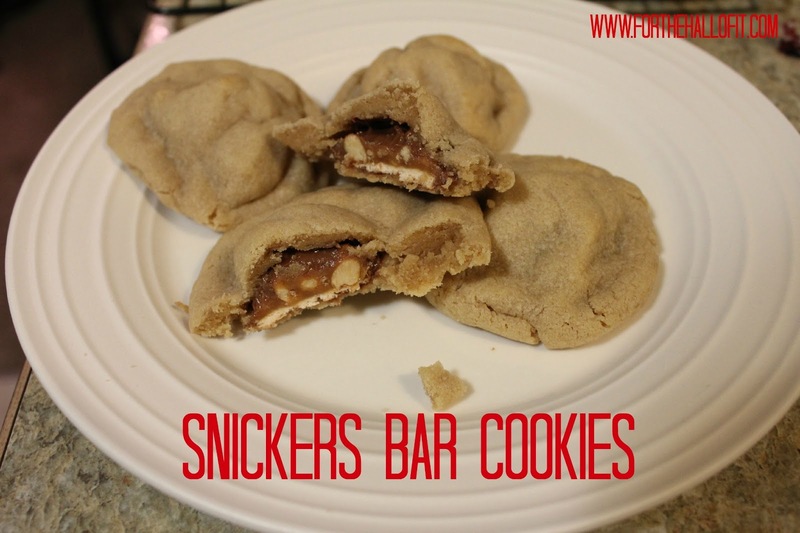 Place on a greased cookie sheet and bake for 10 to 12 minutes. Let cookies cool on baking rack. Makes 4-5 dozen cookies. Note: you will use 1 bag and approximately half of the other bag of candies. These are a hit and not that hard to make. People will think that you spent way more time making these than you actually did. So, take credit for making amazing cookies - or leave them at home and eat them yourself. I won't judge.